The Gran Chaco is an alluvial plain covered with grass and hardwood forest in northeastern Argentina, northwestern Paraguay and southeastern Bolivia. It was Bolivia's only access to the Atlantic Ocean. It was also believed to contain large oil reserves. In 1924 Paraguay issued a set of three stamps with the same map design. 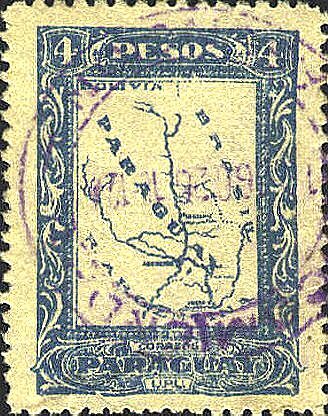 The first six letters of "Paraguay" are spread over the Chaco area, implying a territorial claim to the area. The stamps were withdrawn after Bolivia protested. 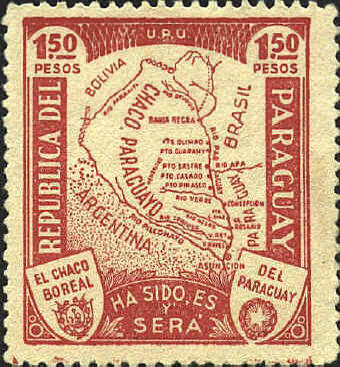 Three years later Paraguay issued a set of two stamps which also claimed that the Chaco was included within the borders of Paraguay. 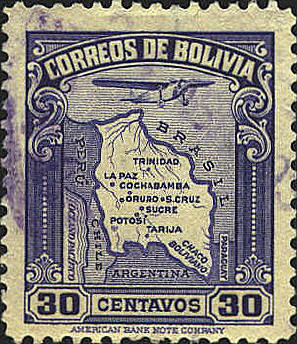 In 1930, and 1935 Bolivia responded with its own stamps showing the Chaco within the borders of Bolivia. The stamps of Paraguay, issued in 1932, show the Gran Chaco as "Chaco Paraguayo" with the slogan "Has been, is, and will be." Shortly after this the Chaco War between Bolivia and Paraguay began. An armistice was signed in 1935, and arbitration resulted in the "Treaty of Buenos Aires. Most of the Chaco was awared to Paraguay, but Bolivia retained navigation rights on the Pilcomayo River to the coast. 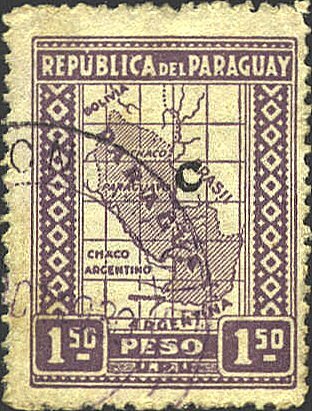 In 1939 Paraguay issued a stamp showing the newly agreed-to border (C121). An inscription on the stamp is "An Honorable peace is worth more than all military triumphs."